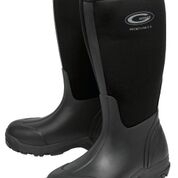 With the Grubs Frostline Black Boots you are purchasing an insulated and water proof Wellington with excellent grips properties, suitable for general use including dog walking, complete with insulation for sustained periods in temperatures down to -10 degrees centigrade. The Grubs Frostline Black Boot has a TRAX sole pattern, with small lugs front & rear to provide good 'push off' grip and a prominent heel for 'braking' grip. The foot bed has a 6mm Nitrocell providing both insulation & cushioning, promising you a comfortable and lightweight outdoor boot that you will love.